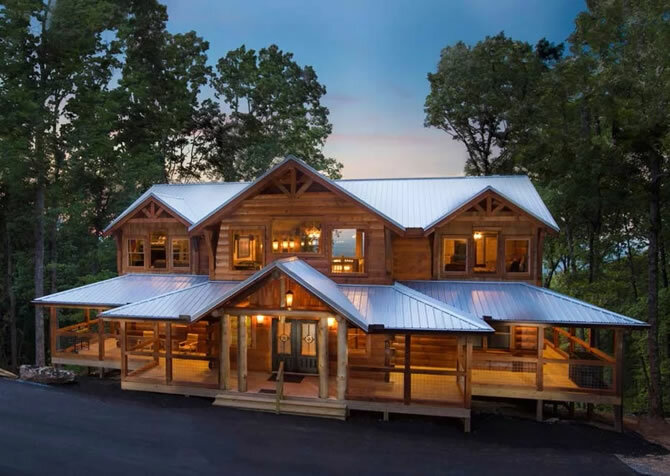 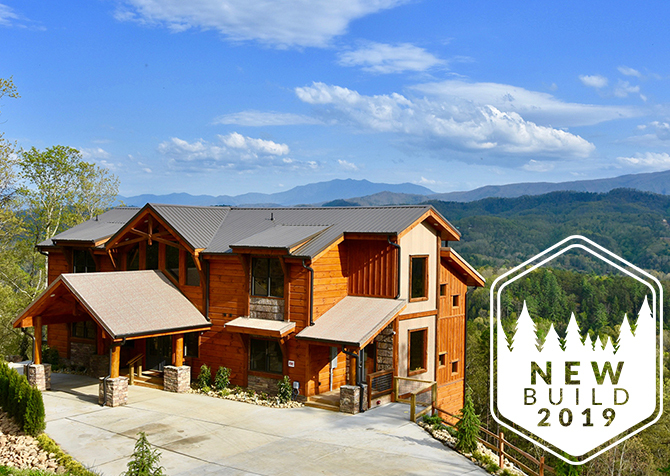 Loaded with top-of-the-line amenities inside and out, this gorgeous new-construction cabin is a luxurious escape for a family vacation, small retreat, or group getaway with friends. It offers plenty of entertainment with an Xbox, Blu-ray player, theater room, private indoor pool, and pool table; it also features lots of relaxing amenities, including an outdoor hot tub, spacious bedrooms, and soothing mountain views. 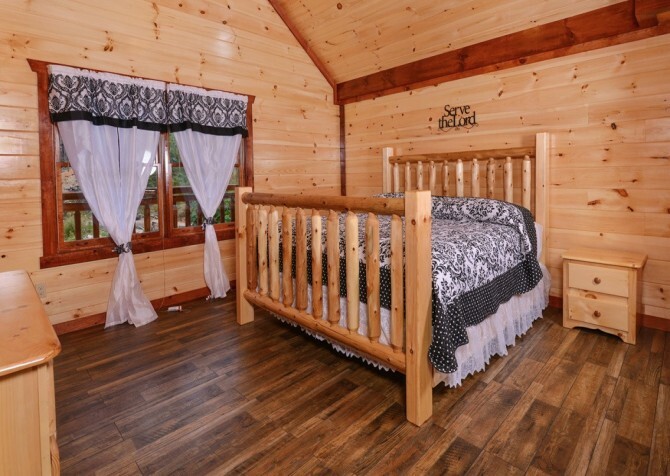 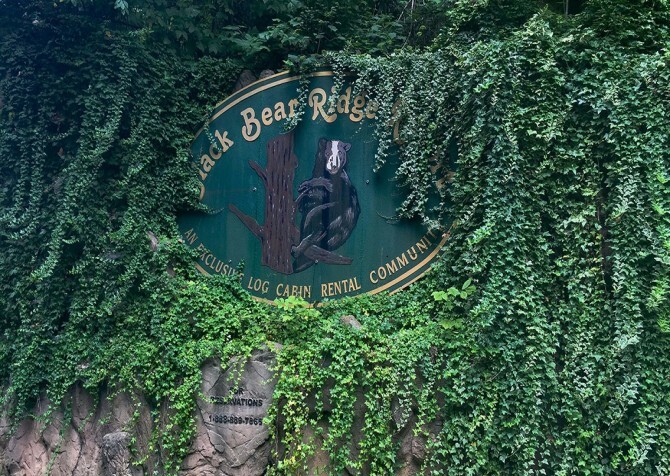 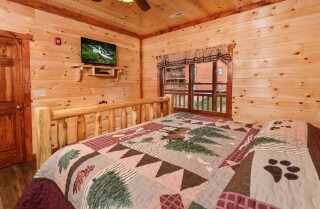 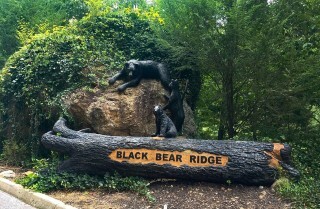 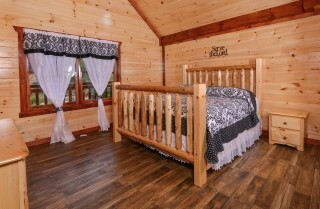 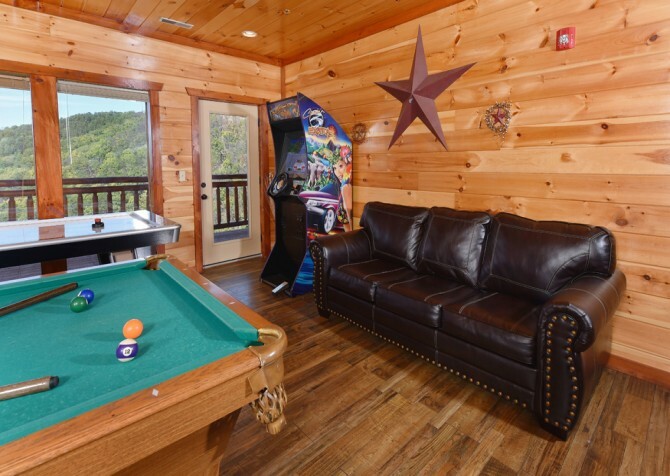 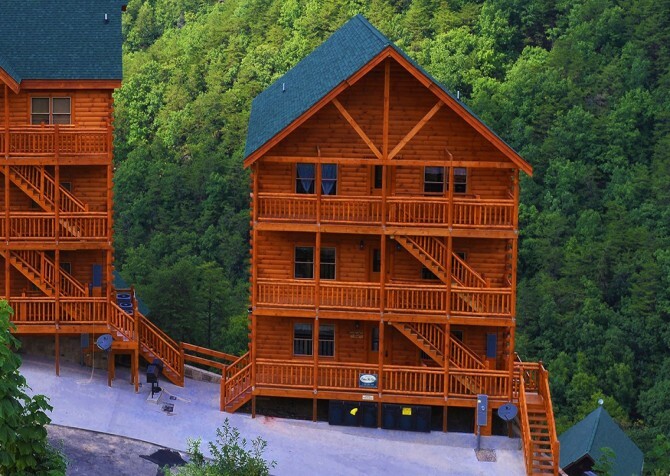 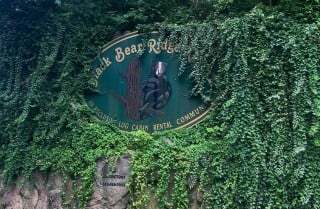 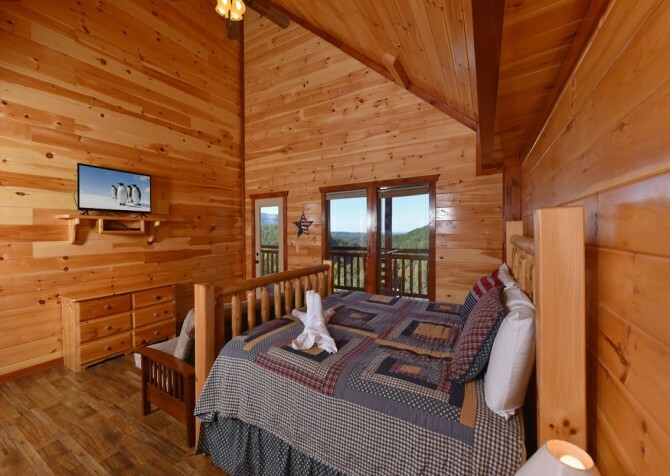 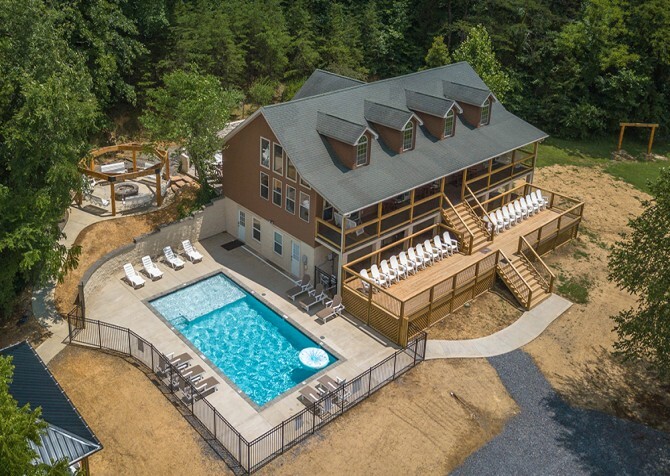 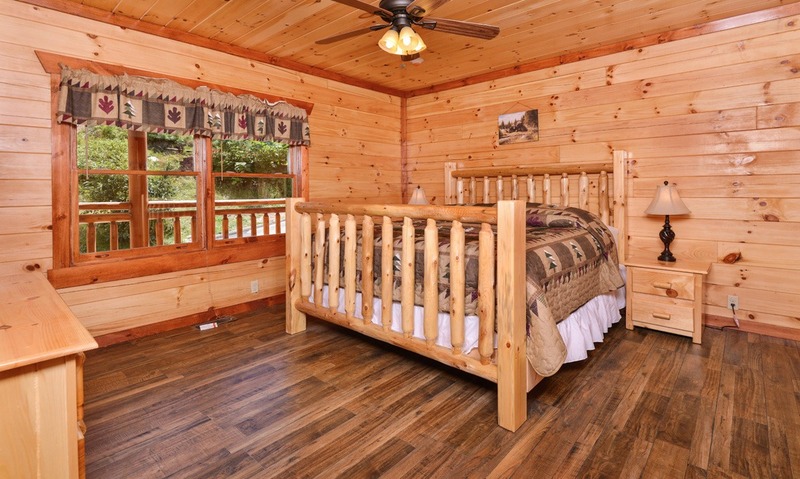 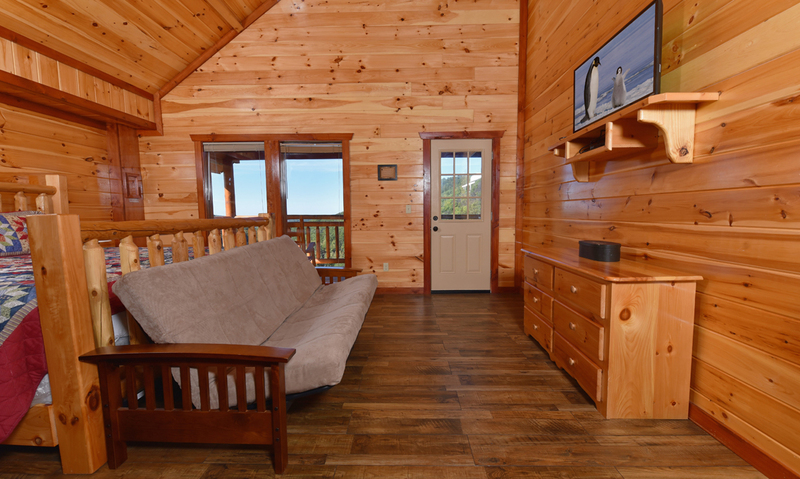 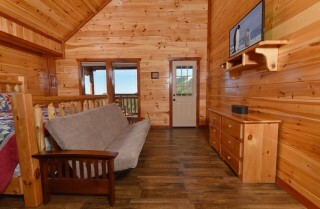 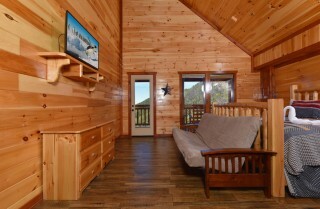 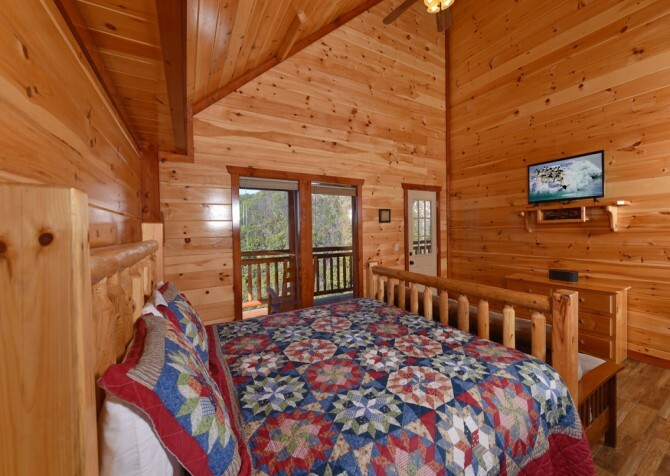 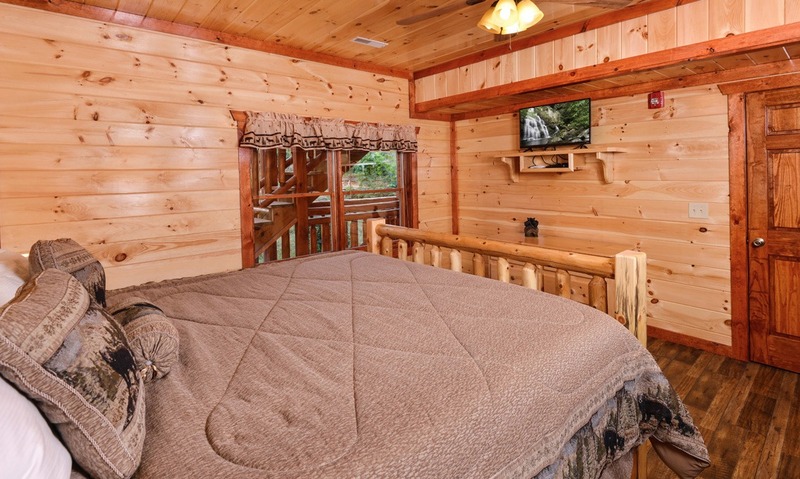 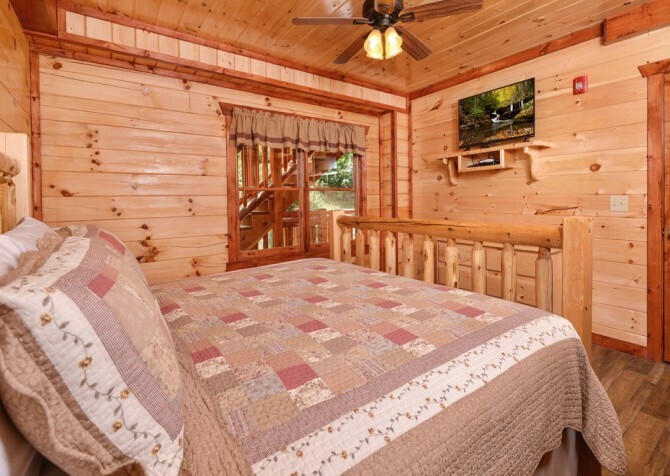 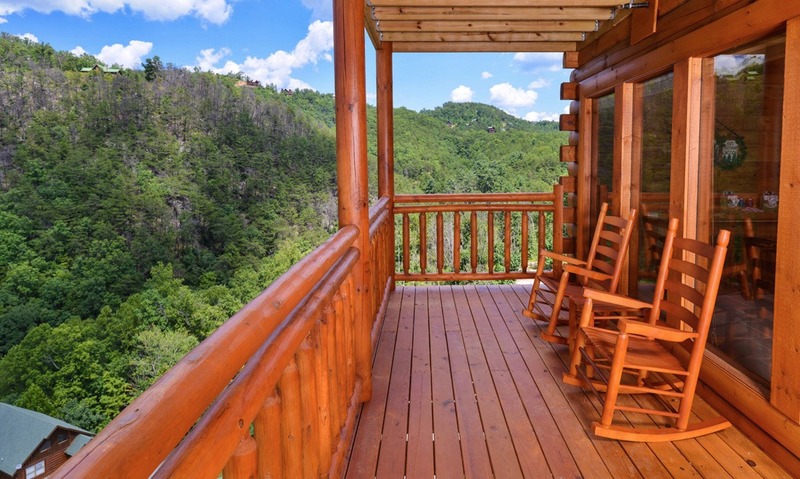 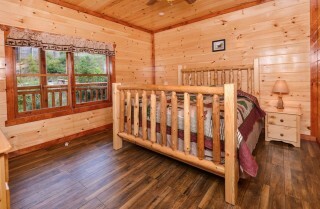 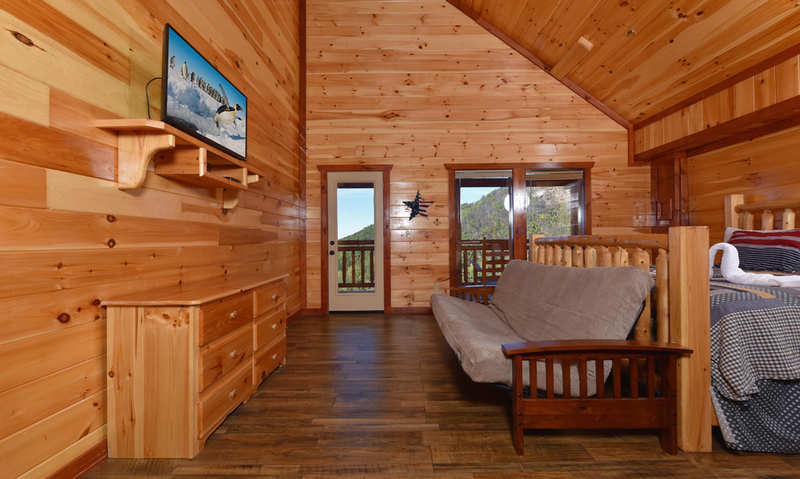 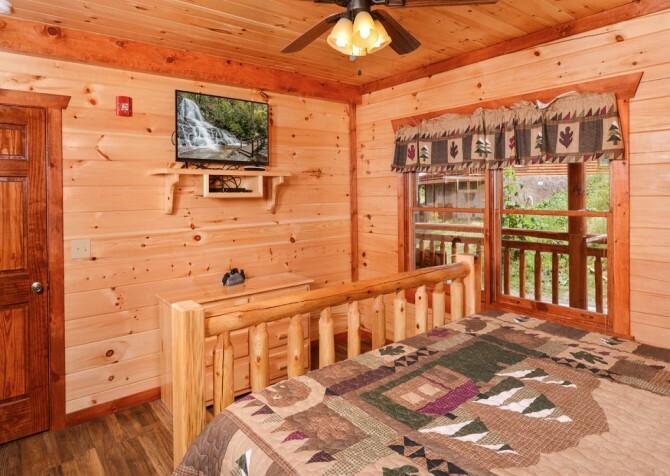 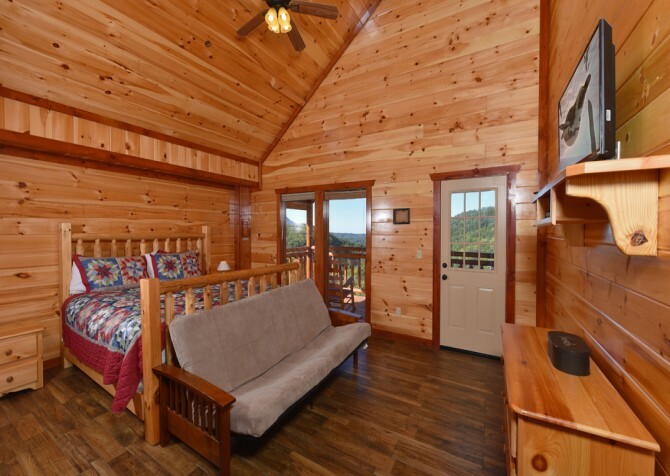 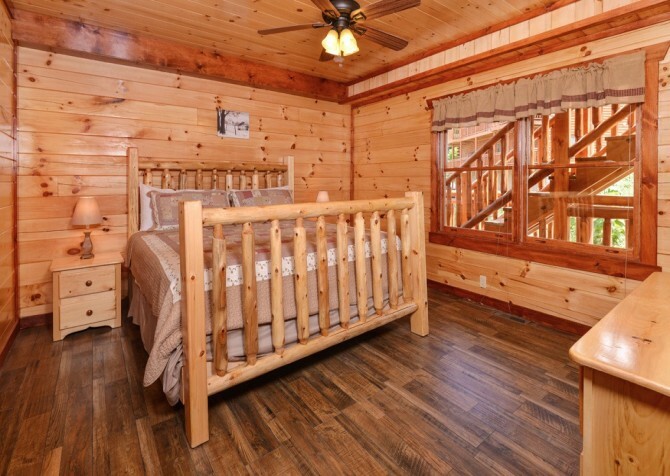 Along with the many amenities you’ll find at this Pigeon Forge cabin, you’ll also have access to community amenities in the Black Bear Ridge Resort. It’s less than 10 miles from downtown, so you’ll be not too far from a wide variety of restaurants, shops, and fun attractions! 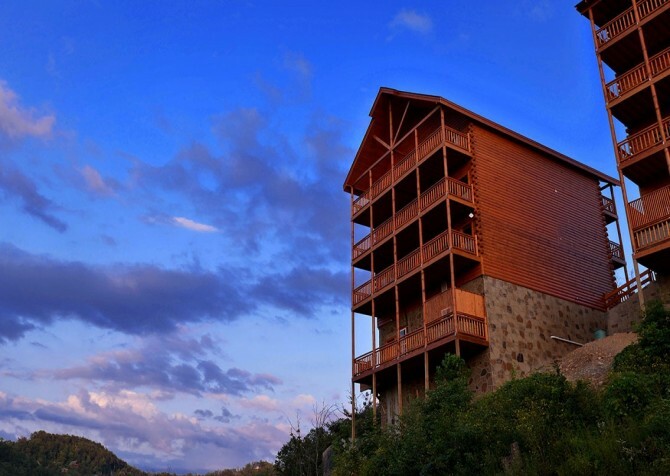 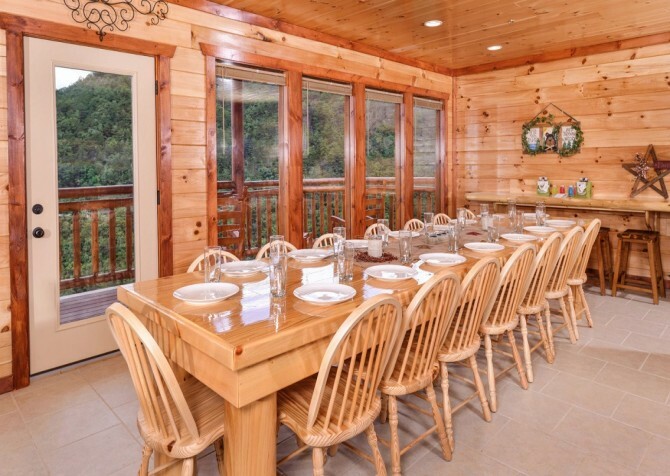 With room to sleep up to 30 guests, it offers the space and amenities you’ll need for a memorable group getaway in the beautiful Great Smoky Mountains! Throughout this luxurious cabin, you’ll find no detail has been overlooked. Beautiful wood interiors are perfectly paired with custom stained trim and a gorgeous stone fireplace that serves as the showpiece of the living room. 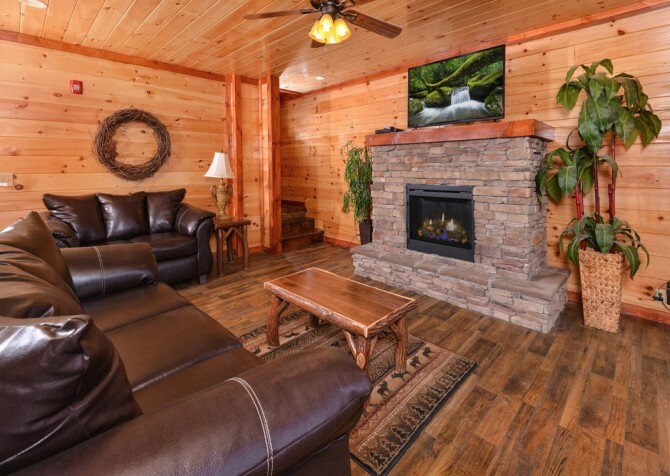 As you relax in front of the fireplace on those cool Smoky Mountain evenings, you can stay warm by the fire or flip on the flatscreen TV to watch a ball game, show, or movies. There is a stylish sleeper sofa and matching loveseat, along with a log coffee table where you can play games. 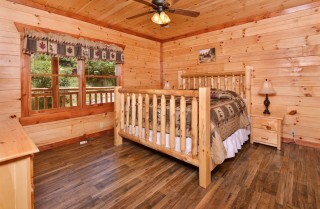 Lamps on the side tables offer the perfect light for reading at night or offering some ambience while watching TV. With a wall of windows showcasing the gorgeous mountain views, you can enjoy the great outdoors even when you’re not outside! Located next to the living room, the beautiful, fully equipped kitchen in Majestic Mountain Waters is a chef’s dream. 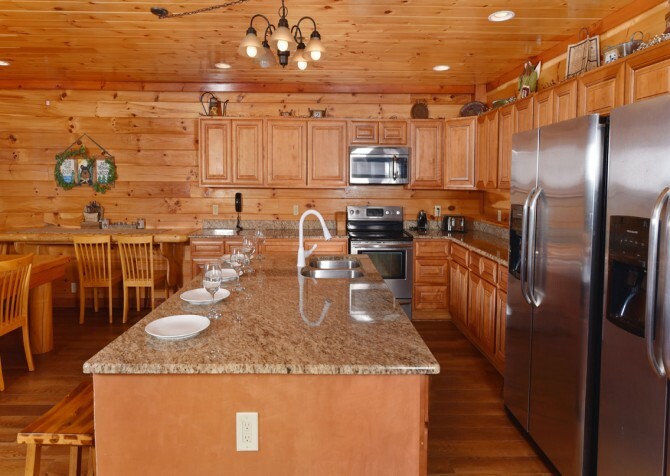 Outfitted with stainless steel appliances – two refrigerators, dishwasher, oven/stove, and microwave – it features everything you could need for preparing group meals in the cabin. 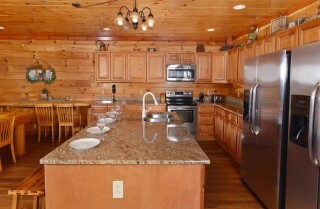 It also has the small appliances you’ll need, along with plenty of dishes, glassware, and utensils. 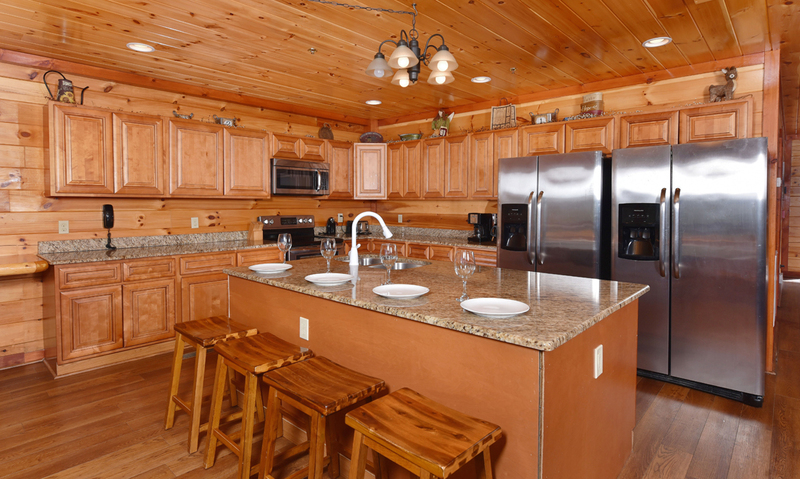 Best of all, there is ample counter space for making meals or setting out a buffet. The large island with a built-in sink is perfect for game-day spreads or holiday meals! 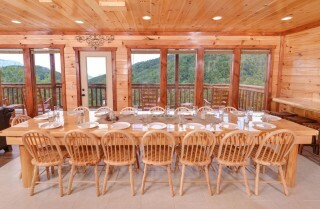 The kitchen also looks out over the scenic Smoky Mountains, so you’ll never feel tucked away while cooking. 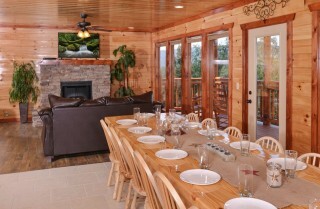 Conveniently situated between the living room and kitchen, the dining area offers a view you won’t find at any downtown restaurant. 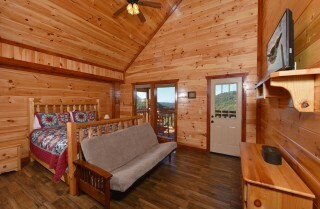 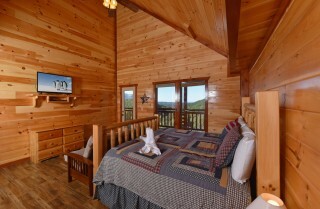 Look out over the rolling hills as you enjoy a homemade meal in the comfort of your own cabin. The dining table seats 15, and there are three more stools at a bar area. This means that all 18 guests can sit down for a meal together – what a wonderful way to spend time at your cabin. 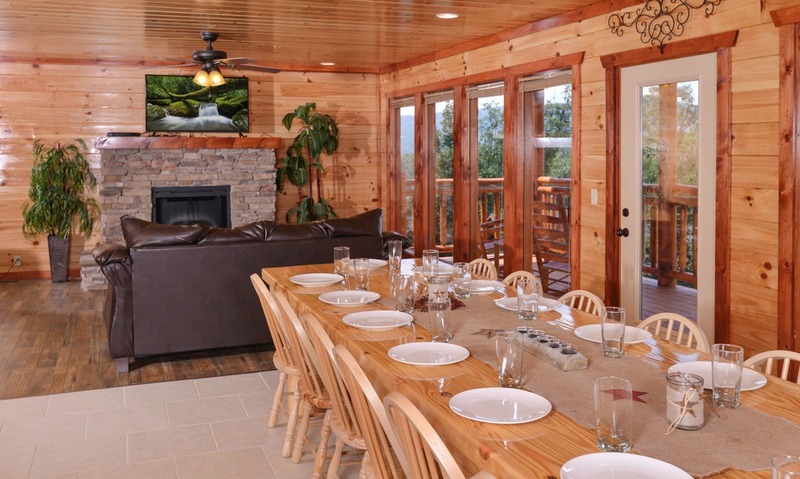 Because it’s open to both the kitchen and living room, the dining area also allows guests to visit while enjoying all three rooms. So whether you’re eating, cooking, or just relaxing and watching TV, you can have some quality time with the whole group. 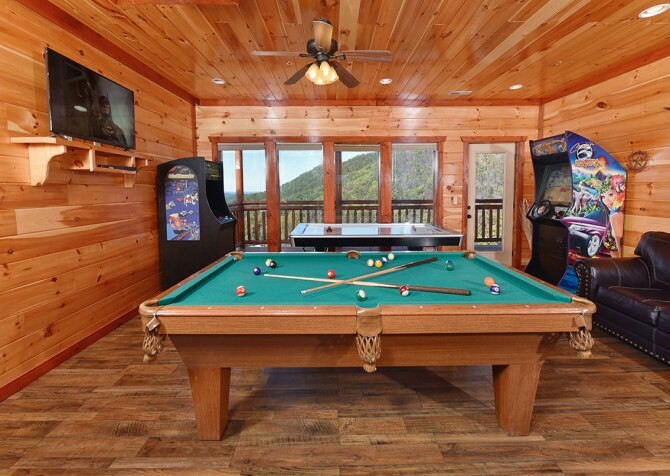 A beautiful and fun space for playing games and hanging out, the rec room in Majestic Mountain Water is loaded with games that both kids and adults will love. It will keep a group entertained and make you want to stick around the cabin just a bit longer. 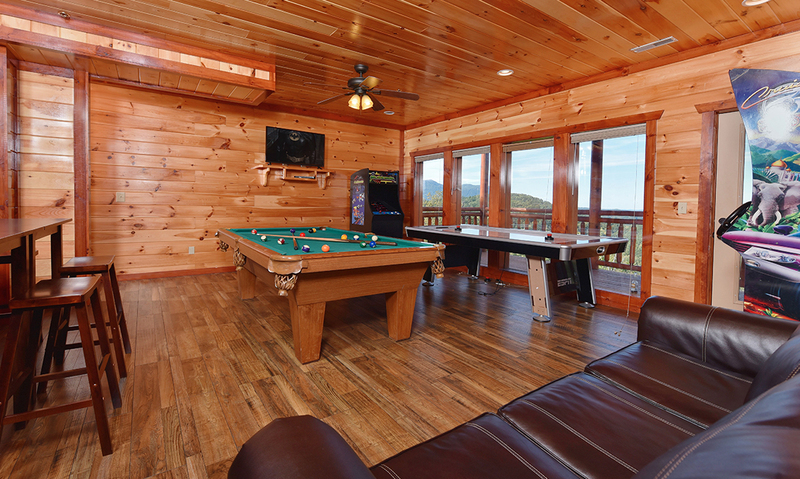 And of course, this room offers more of those stunning mountain views, so you won’t miss out while you’re playing here. 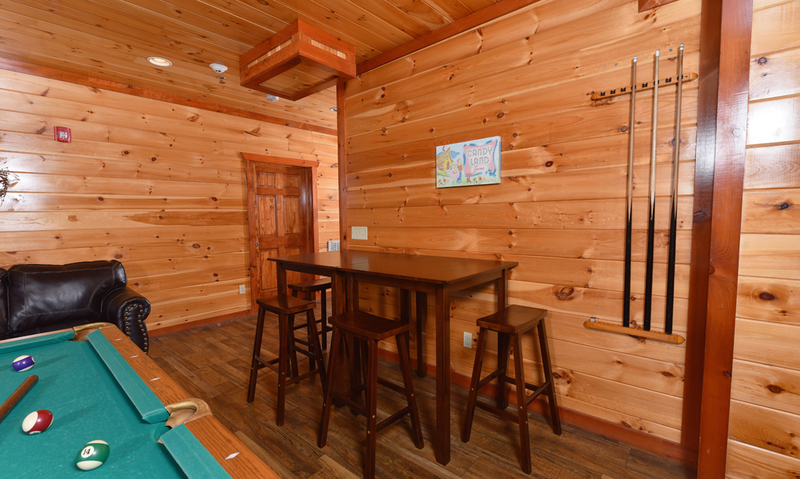 In the rec room you’ll find a pool table, air hockey table, two arcade games, and a flatscreen TV. You can set up tournaments or just play around on those lazy afternoons around the cabin. 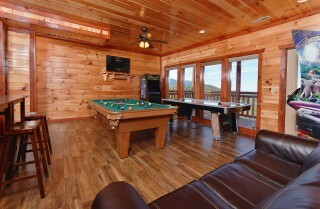 There is also a sleeper sofa here, and sleeping where they play is always a big hit with the kids! Fit for a fun movie night in the cabin, the theater room features a big screen TV, Blu-ray player, and lots of comfortable seating. There is also space around the room for kids to throw down sleeping bags or blankets to watch the movie. 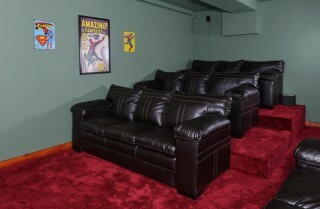 It offers the entertainment of going to the movies without the uncomfortable seats and high-priced snacks. 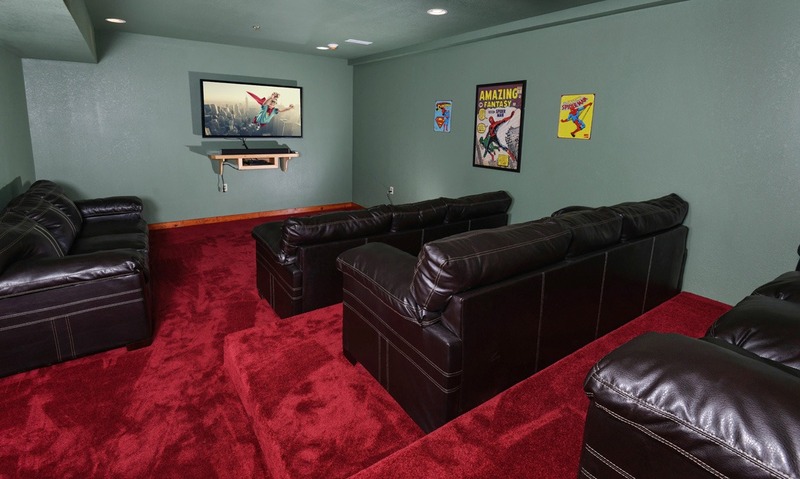 You can pop some popcorn in the kitchen, grab a drink, and kick back to your favorite movies. There are also 2 sleeper sofas located in this room. Each of the bedrooms in Majestic Mountain Waters features its own TV, ensuring that all guests get to watch their favorite shows before heading off to bed. 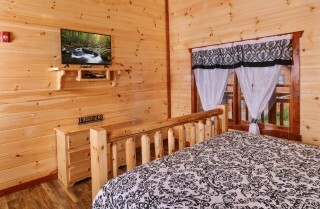 The rooms are tastefully decorated and offer comfortable beds and space to relax. 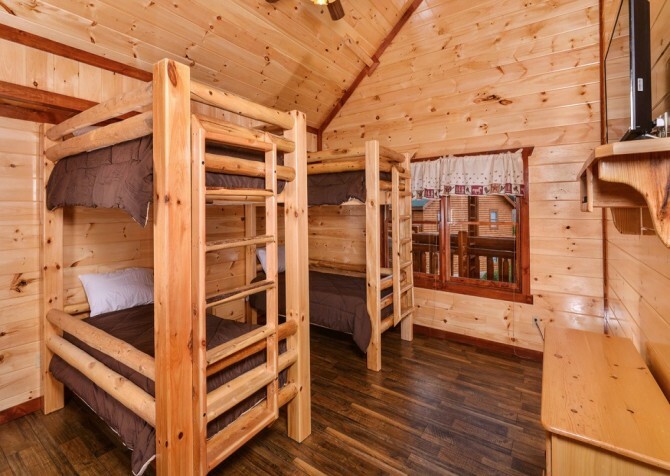 In all, there are 7 king-size beds and 2 sets of twin bunk beds. 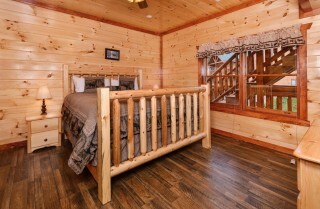 At night, guests will appreciate their own private escapes. 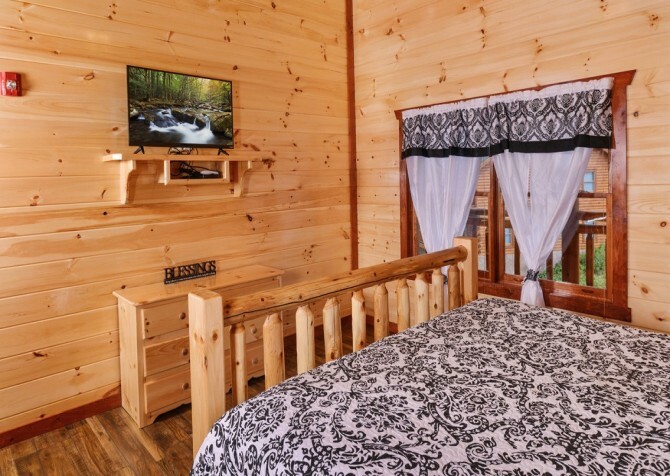 There are also bathrooms attached to all of the bedrooms, so everyone can enjoy plenty of privacy and room to get ready before a day in town. 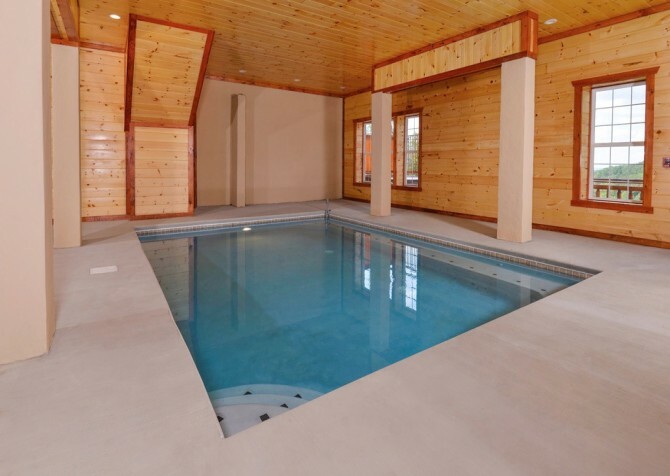 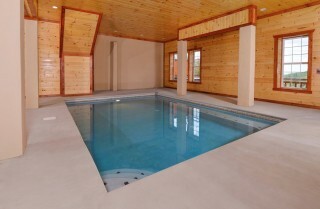 One of the best features of this luxurious cabin is the private indoor pool. 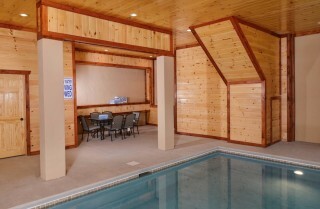 It’s located in a spacious room that is large enough for a group to hang out and relax. The pool room also has a dining table where you can have a snack or a drink when you need a break from the water. 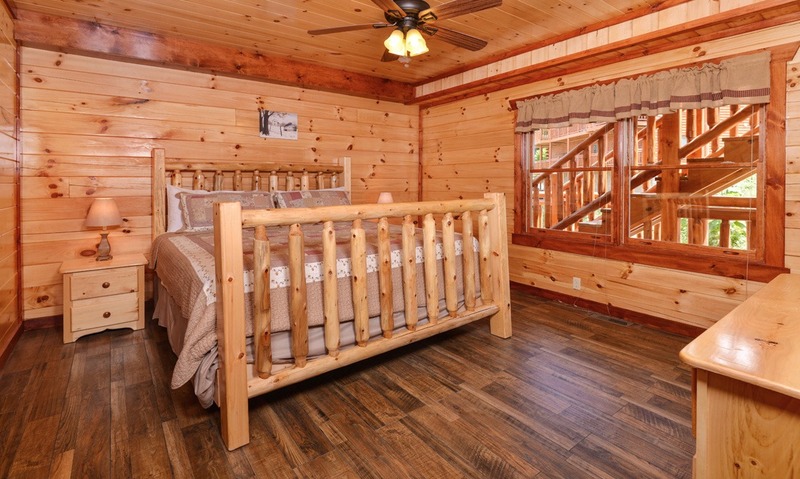 Here, enjoy more of those beautiful wood details all around the room. 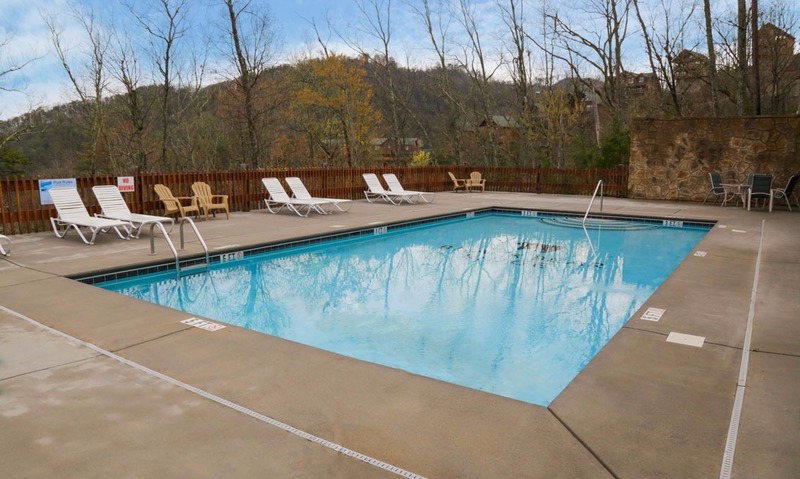 Year-round, you can enjoy a pool day regardless of the weather! With such fantastic mountain views, you’ll want to spend as much time in the great outdoors as possible. 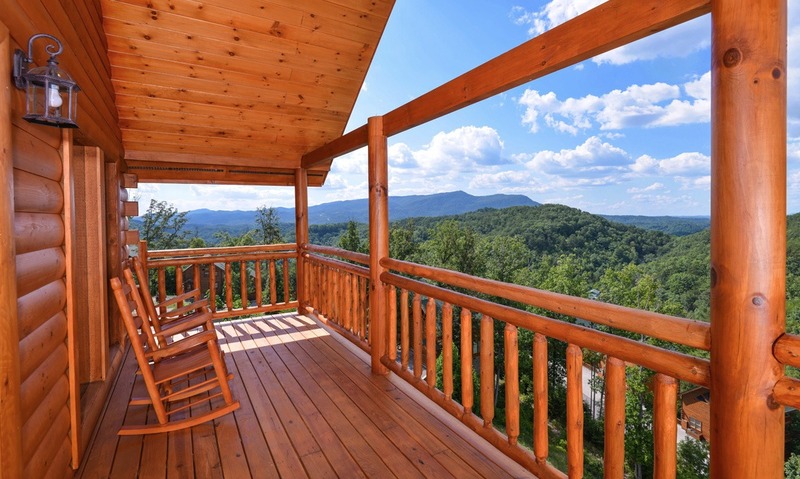 Multiple levels of decks provide you with plenty of room for the group to breathe in that fresh mountain air. On the upper deck, sit back in the rocking chairs as you enjoy a glass of wine or have a cup of coffee to start the day. 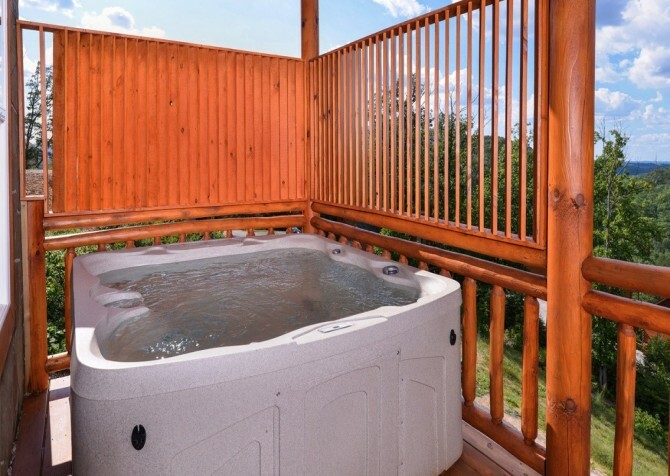 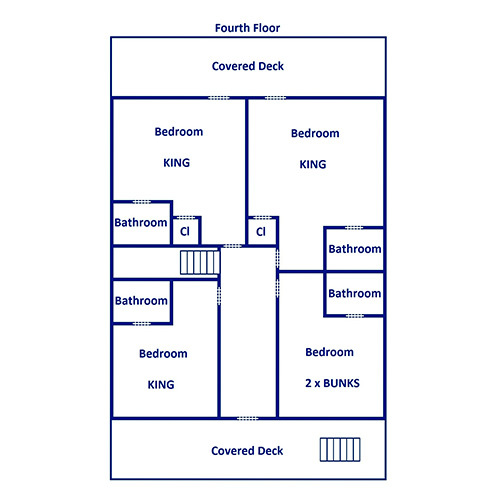 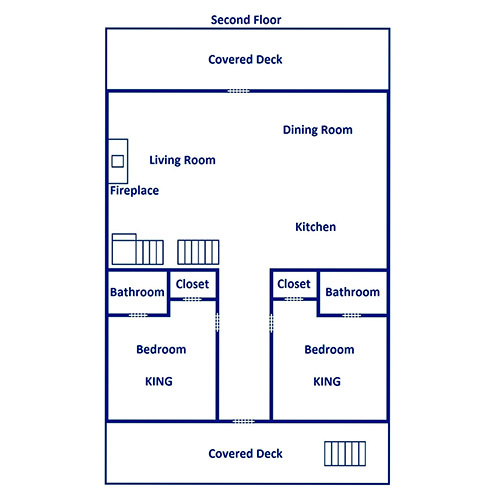 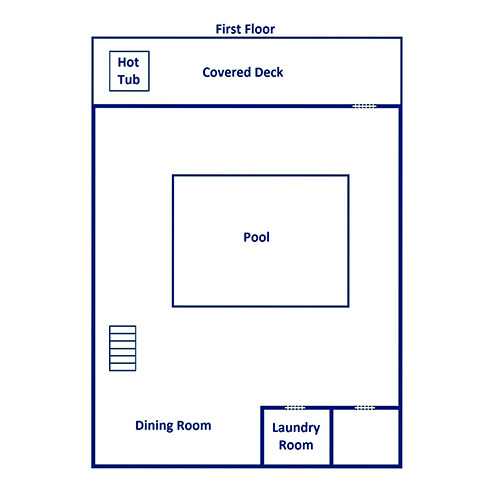 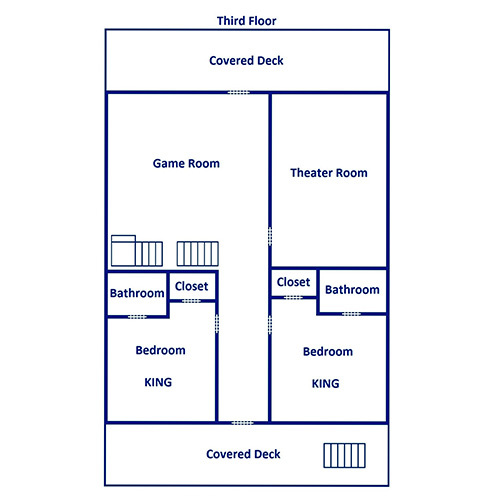 On the lower level, find more rocking chairs and a hot tub with a privacy screen. 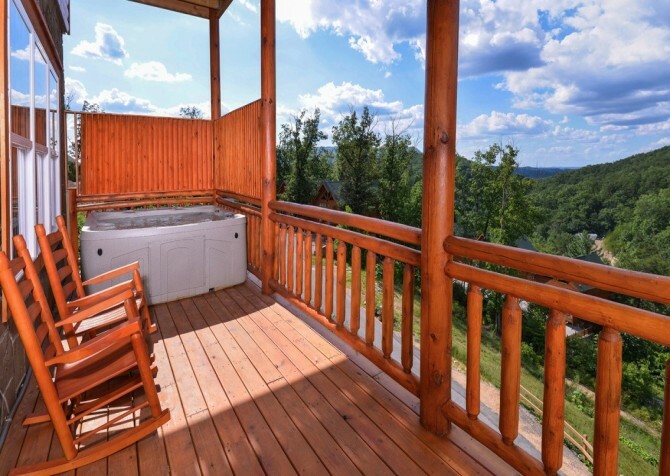 After a busy day exploring the Great Smoky Mountains National Park or browsing the shops and checking out the attractions along the Parkway, a relaxing soak in the hot tub will be just what you want! 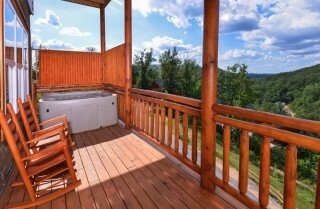 Other amenities If you love to grill out, you’ll appreciate the two charcoal grills at the cabin. 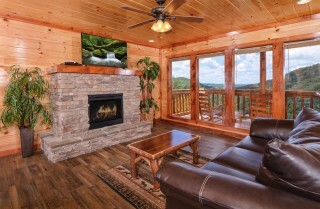 You can fire them up to enjoy burgers and steaks while you take in your beautiful natural surroundings. The cabin also features an Xbox with games that the kids will love. A washer and dryer are more nice conveniences, allowing you to freshen up clothes after a hike or just pack light and do laundry during your stay. One of the newer attractions in Pigeon Forge, The Island features restaurants, shops, kids’ rides, and entertainment. You can watch the show fountains, listen to live music, browse the many unique shops, or take a ride on the Great Smoky Mountain Wheel. 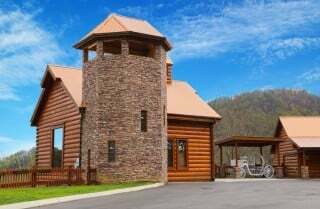 Watch horse stunts, listen to toe-tapping music, and dine on a hearty Southern meal at Dolly Parton’s dinner show in downtown Pigeon Forge. 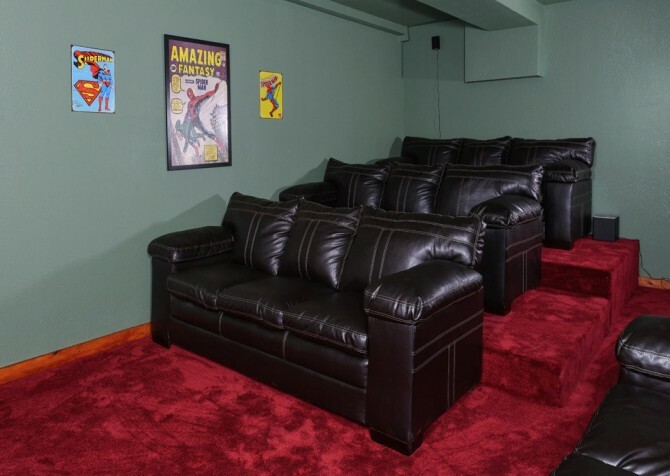 This exciting show is family friendly and offers a fun night on the town! If you love country music, you’ll love the Country Tonite Theatre. This exciting show features lighting effects, comedy, costumes, music, and more! "Great company to rent from, extremely attentive and always answered questions prior to trip. 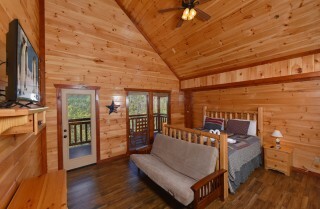 Cabin was beautiful and everything listed was included. Would recommend to anyone."